Wayne State University Press, 9780814344903, 364pp. 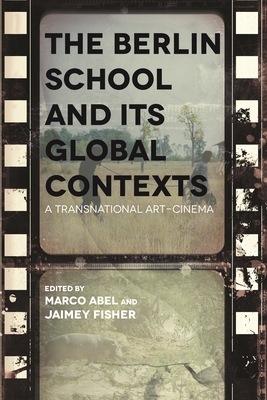 The Berlin School and Its Global Contexts: A Transnational Art-Cinema came about in light of the Museum of Modern Art (MOMA)'s 2013 major exhibition of works by contemporary German directors associated with the so-called Berlin School, perhaps Germany's most important contemporary filmmaking movement. Christoph Hochh?usler, the movement's keenest spokesperson, stated that "the Berlin School, despite what the label suggests, is not a specifically German phenomenon. All over the world there are filmmakers exploring related terrain." In response to this "transnational turn," editors Marco Abel and Jaimey Fisher have assembled a group of scholars who examine global trends and works associated with the Berlin School. The goal of the collection is to understand the Berlin School as a fundamental part of the series of new wave films around the globe, especially those from the traditional margins of world cinema. For example, Michael Sicinski and Lutz Koepnick explore the relation of the Berlin School to cinema of Southeast Asia, including Apichatpong Weerasethakul and Tsai Ming-liang; Ira Jaffe and Roger Cook take a look at Middle Eastern film, with Nuri Bilge Ceylan and Abbas Kiarostami, respectively. The volume, however, also includes essays engaging with North American filmmakers like Kelly Reichardt and Derek Cianfrance as well as European auteurs like Antonioni, Tarr, Porumboiu, McQueen, and the Dardennes. Bringing German cinema into dialogue with this series of global cinemas emphasizes how the Berlin School manifests-whether aesthetically or thematically, politically or historically-a balancing of national particularity with global flows of various sorts. Abel and Fisher posit that since the vast majority of the films are available with English subtitles (and at times also in other languages) and recent publications on the subject have established critical momentum, this exciting filmmaking movement will continue to branch out into new directions and include new voices. The Berlin School and Its Global Contexts folds German-language cinema back into conversations with international as well as transnational cinema. This volume will be of great interest to scholars of German and global cinema. Marco Abel is professor of English and film studies at the University of Nebraska. He is the author of The Counter-Cinema of the Berlin School and Violent Affect: Literature, Cinema, and Critique After Representation, as well as the co-editor of Im Angesicht des Fernsehens-Der Filmemacher Dominik Graf and the book series Provocations. He is currently in the process of co-editing Celluloid Revolt: German Screen Cultures of the Long Sixties.Jaimey Fisher is professor of German and Cinema and Digital Media at the University of California, Davis as well as the director of the UC Davis Humanities Institute. He is the author of Disciplining German: Youth, Reeducation, and Reconstruction after the Second World War (Wayne State University Press, 2007), Christian Petzold, and co-editor of Spatial Turns: Space, Place, and Mobility in German Literary and Visual Culture, among other volumes. His current project analyzes war films in Germany from 1914-1961.